Find out what our experts have to say about Royal Enfield Himalayan! The Royal Enfield Himalayan is the only adventure tourer available under Rs 2 lakhs and a capable one at that. It comes with sturdy off-road underpinnings and an accessible 411cc motor that is high on torque. It is your best bet if you are looking for adventure touring on a budget. The least priced variant is Royal Enfield Himalayan STD priced at Rs. 2,11,900 and the most priced variant is Royal Enfield Himalayan Sleet priced at Rs. 2,14,962. Choose the Royal Enfield Himalayan which fits the bill of you. In the year 2016, Royal Enfield surprised the biking enthusiasts with the Himalayan. The Royal Enfield Himalayan is meant for those who want to tour on bikes but would like to do off-roading adventure as well. Initially the bike which was launched with the carbureted engine was later discontinued with the advent of BSIV emission norms. So, the company has now launched the bike with the new BSIV compliant Fuel Injected (FI) engine. Not much has been changed look-wise, but small changes include the tank lid, foot pegs, handlebars and the mirrors are now all-black. Included also are the refined engine for the Himalayan with a much smoother 5-speed gearbox, but the clutch still remains heavy. The super detailed instrument cluster remains the same as it is the best Royal Enfield can provide. Royal Enfield Himalayan currently competes against the likes of the Bajaj Dominar 400, and the Mahindra Mojo. The Himalayan is available in 2 colours - Granite (Black) & Snow (White) and is priced at Rs.1,68,000 (Ex-Showroom, Delhi). From head to tail, the Royal Enfield Himalayan continues to look like a no cosmetic and no frills adventure machine. 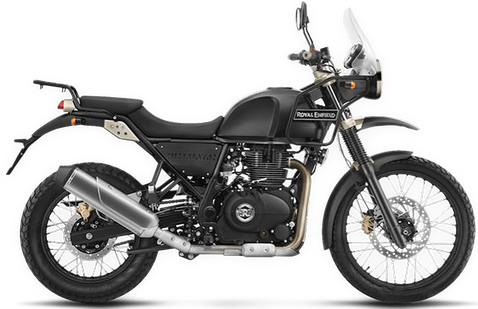 The tall aggressive stance of the bike and all metal body is purpose built for the rocky off-roads. In terms of styling, not much has been changed in the Himalayan FI. The basic design and the chassis remains the same as the old model. Subtle changes include the black-out tank lid, foot pegs, handlebars and the mirrors. The instrument cluster remains unchanged as it is the best console from Royal Enfield so far. The seat and tank is sculpted in such a way that the rider can easily stand while riding the bike. This is a very important feature used while riding on off-road conditions. That 15 litres of sculpted fuel tank is enough for those adventure rides. Headlight provided is powerful and easily lights up the road ahead. Royal Enfield Himalayan’s 400cc single cylinder engine has been re-tuned to match the BSIV requirements. Old carburetor now has been replaced by a new fuel injection system. The 411cc, single cylinder, 4 stroke, air cooled, SOHC and fuel injected engine produces a max power 24.5 bhp at 6500 rpm and peak torque of 32 Nm at 4250 rpm. The addition of fuel injection has made the Himalayan more faster and smoother. The engine is now definitely better as it is more refined and the NVH levels have gone down. Off-roading is much easy as the power delivery is more linear and has a strong low & mid range performance. The top end still lags the grunt as Royal Enfield has concentrated more on the off-roading capabilities. Shifting the gears is much smoother now, as the 5-speed gearbox with constant mesh has been re-worked. The fuel economy now has been increased to around 30-35 kmpl with the reworked engine. Royal Enfield Himalayan rides on the same 21 inch front and 17 inch rear wheel. The large wheel in the front provides confidence to the rider on uneven terrain. The knobby dual purpose tyres of Ceat Gripp on the bike won't leave you out of traction on loose surfaces. Suspension duties are handled by 41mm telescopic forks with 200 mm travel at the front and monoshock linkage with 180 mm wheel travel. The suspension setup feels plush while riding in both on road and off road conditions. While other adventure bikes have high seats the Himalayan seat height is just 800mm which makes it accessible for any rider. Seats are well cushioned to provide you comfort on those long rides. With the new BSIV update, the Royal Enfield Himalayan has the mandatory Always Headlight On (AHO) feature integrated in its headlight. This feature improves the visibility and increases the safety of the rider while riding in any weather. To improve the rider comfort and safety on any road conditions, the bike is equipped knobby dual purpose tyres of Ceat Gripp. Stopping power is decent with the front and rear disc brakes on the Himalayan. But it still lacks the all important Anti-Lock Braking System (ABS) which would prove very useful on those slippery terrains.